Doug Jones recently started volunteering at A.G. Rhodes’ Cobb home. He comes about two days a week and makes an effort to participate in various activities and help wherever he can. He enjoys participating in music therapy and horticulture therapy. However, his most significant contribution and passion is running the cooking club. After Doug’s father passed away, he started spending a lot more time with his mother. He would frequently visit her at her retirement community in Hilton Head, SC. Casual dinners he would cook for her soon turned into quite the social event. He began preparing gourmet menus for his mom and many of her friends. He would throw on his chef’s hat, and apron and the dinner party would commence. These dinners went on once a week for eight years. After Doug’s mother passed away, he wanted to find a way to stay involved with a retirement community. He found that his background in being a chef would be a great way to get involved. 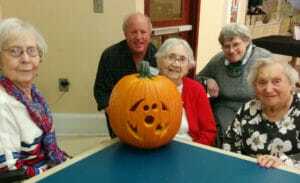 Doug loved spending time with his mother and her friends at their retirement community. “I enjoyed listening to their stories, hearing about their passions, and talking about past times,” said Jones. It was this time spent with his mother and her friends that inspired him to start volunteering at A.G. Rhodes. What does the “Cooking Club” entail? Doug starts by creating the menu and handing it out to everyone. He sometimes has one or two people helping him, or he will create a recipe that everyone can participate in. However, some of the resident’s hands and muscles don’t work as well as they used to and their dexterity isn’t such where they can finely cut, chop and cook. Because of this, Doug usually does most of the cooking while the residents watch and visit with him. Once he has finished preparing the dish, they all sit together and eat whatever delicious item Doug whipped up that day. Doug always tries to cook gourmet meals that range from a wide variety of foods. 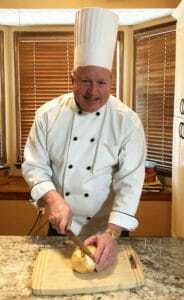 He prepares everything from breakfast dishes to soups to entrées and desserts. He tries to keep his dishes topical to the season. Some of the resident’s favorites include his Irish soda bread around St. Patrick’s Day, his hazelnut chicken, which is one of his lifetime specialties, peppermint bark dip around Christmas time, crab with dill and cayenne toast as a brunch dish, pumpkin fritters with caramel sauce in the fall, and Valentine’s Biscoff Ritz cookies around Valentine’s Day. What is your favorite part about volunteering for AG Rhodes and running the cooking club?